Well, hello! 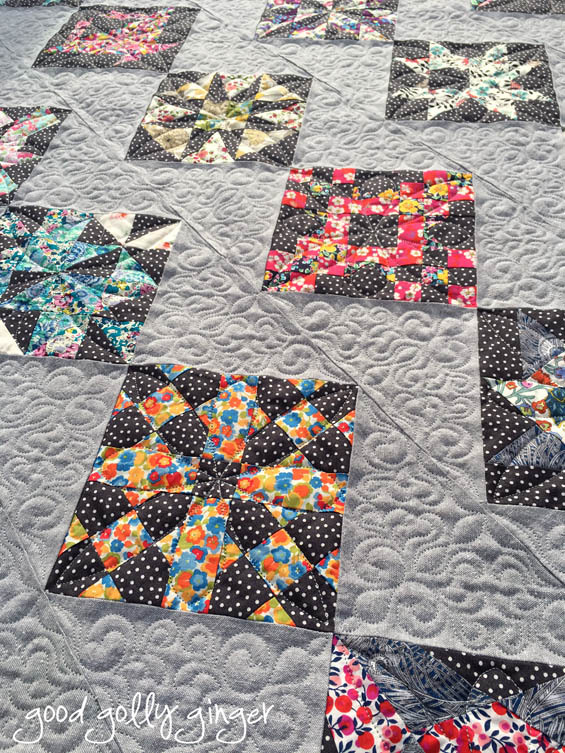 I haven't blogged for seven months now, but I have not stopped quilting! Life got busy at the beginning of this year, and I needed to make more time for my kids and taxi them around where they needed to be. Now the kids are back in school, and I can share all that I have worked on in 2016. 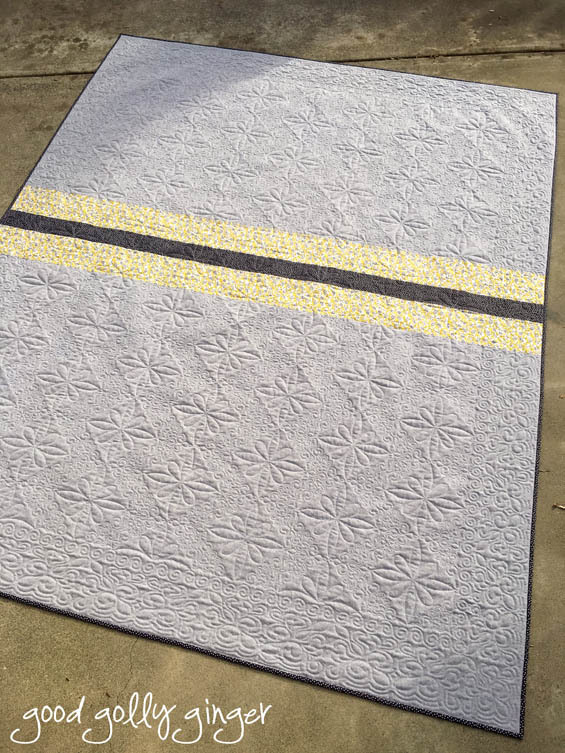 I'll start with my finished Farmer's Wife quilt. Whew! This was a challenge. 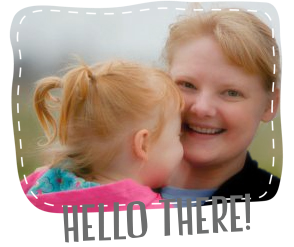 I began by following Gnome Angels' wonderful tutorials, and then I finished at my own pace. 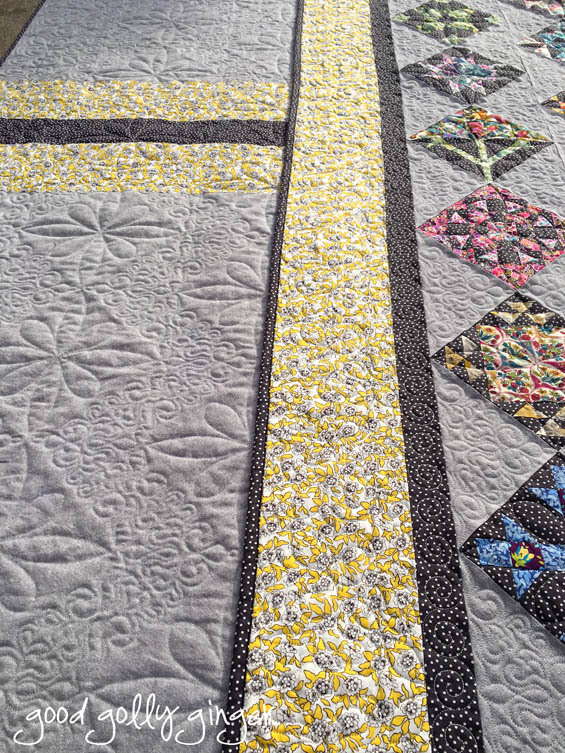 Rather, I got tired working on this quilt, and I spent the month of April feverishly getting it done. I did 63 of the blocks in Laurie Aaron Hird's book. Instead of using the templates in the book, I redrew almost every block in EQ7 so I could have the rotary cutting instructions or the patterns for foundation paper piecing. This worked really well for me. Over the years of fabric collecting, I have accrued some gorgeous Liberty of London fabric. I saved every piece waiting for just the right project. This quilt was it! There are 84 pieces in that 6-inch block! After this block, I decided I was not going to do all 99 blocks. I admire those quilters that have done all of them. The background fabric within the blocks is Moda Fabrics Gardenvale Black Swan Dots by Jen Kingwell. The gray background fabric is Robert Kaufman Essex Yarn Dyed Linen Cotton in Steel. The outer border is Liberty of London Dynasty Yellow. Look at that backing! 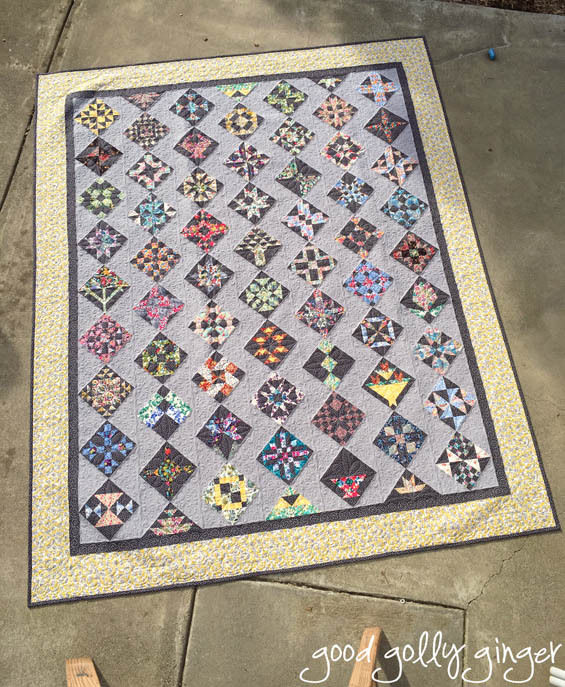 I spent one and a half weeks quilting this thing to death! 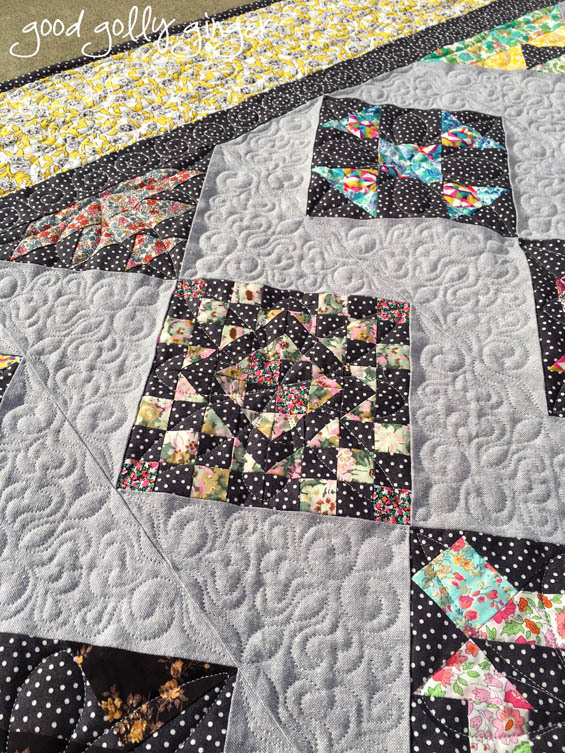 Can you tell how in love I am with the quilt backing?! For the quilting, I used Isacord thread in Fog. It blends beautifully with all of the fabrics. Here is the quilt view from on top of the ladder in its full glory. I'm so glad to share my projects with you again. 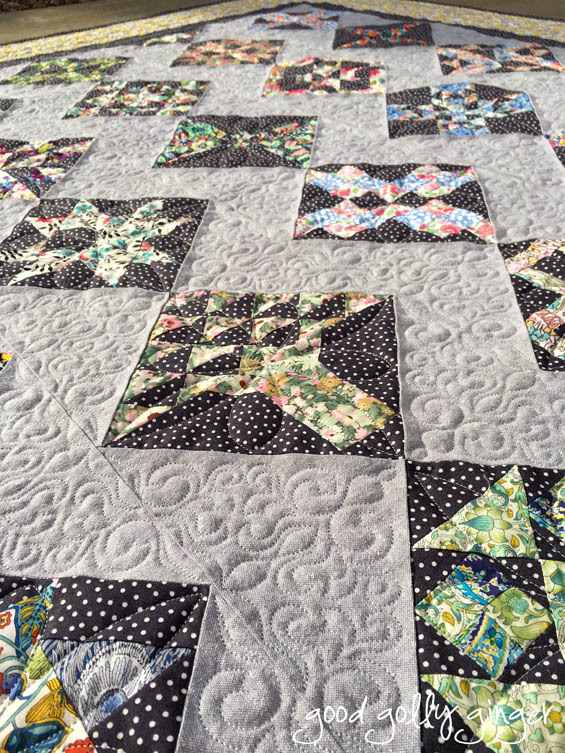 I have done a lot of quilting for customers too over the past months that I have been missing from my blog. I will be sharing those soon. Putting it all together is already a bit daunting but looking at yours all finished inspires me. 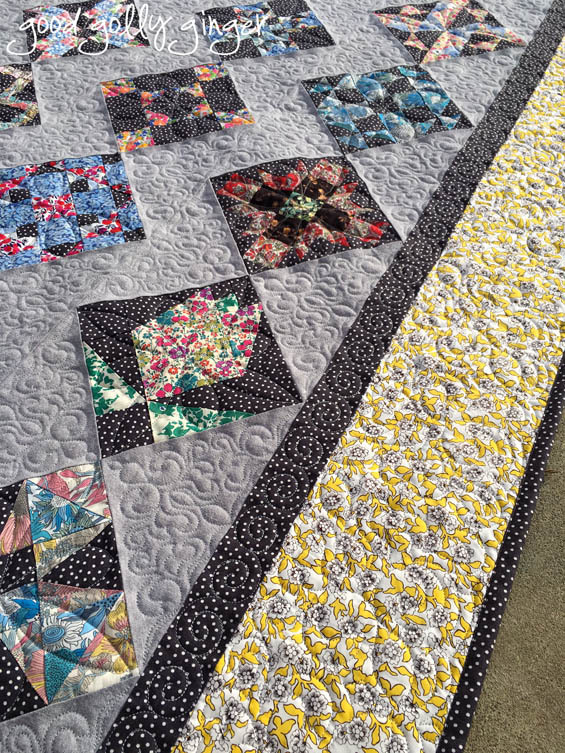 That is a gorgeous quilt, and beautiful quilting. I'm glad you linked on Sew Cute Tuesday. This was a treat for the eyes. It's gorgeous!!! I've been working on one off and on using rotary instructions by Karen Walker on Craftsy. I don't think I'll do all of the blocks. I like your setting. Yay☺ I was happy to see a blog post from you in my in-box! What a work of art - even though it was a long haul, you now have a keepsake. Enjoy it! Katie, it is stunning! 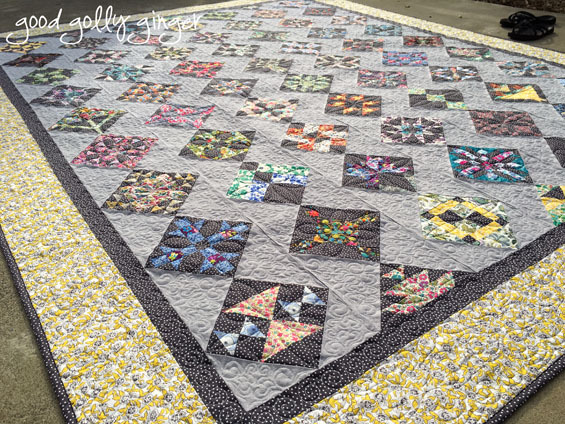 I never would have put Liberty with black, but now, I am going to get to work on a quilt like this! Thank you! This is just gorgeous! Congrats on the beautiful finish!